It’s been a while since I last posted a review here at TheMakersWorkbench, and I apologize for that. Since I took up the East Coast News Editor position at TweakTown.com I have had little time to do anything but write news, but today that changes. 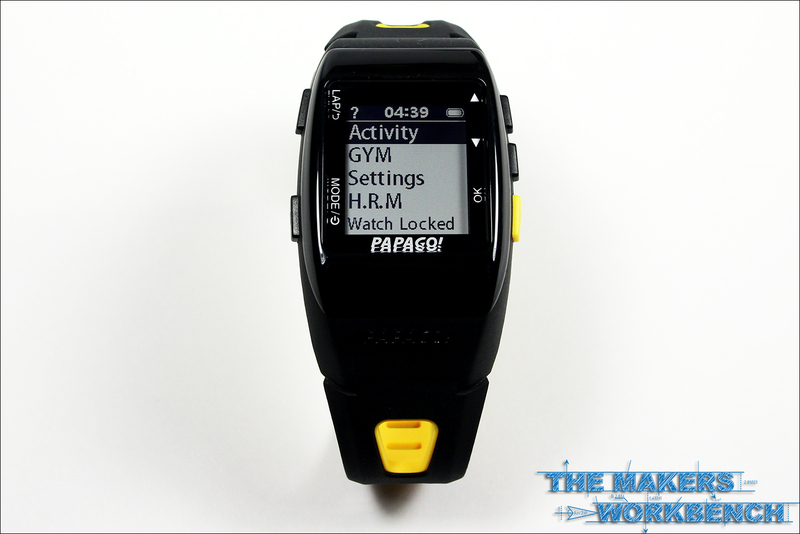 During my trip to CES 2014, I met with a wonderful company named PAPAGO, and was quite intrigued by their offering of high-quality Dash Cams, Action Camera’s, and Fitness Watches, and upon returning home, they offered me a chance to review some of their products. Today I am taking a look at the PAPAGO GOWatch 770, a GPS enabled fitness tracking watch that serves not only as a pedometer with GPS precision, but as a personal trainer and goal tracker as well. While technically in the same category as Smartwatches, I would classify the PAPAGO GOWatch 770 as more of a fitness band with smartwatch features. It’s time to get started, so grab a handful of popcorn, sit back and enjoy the show! 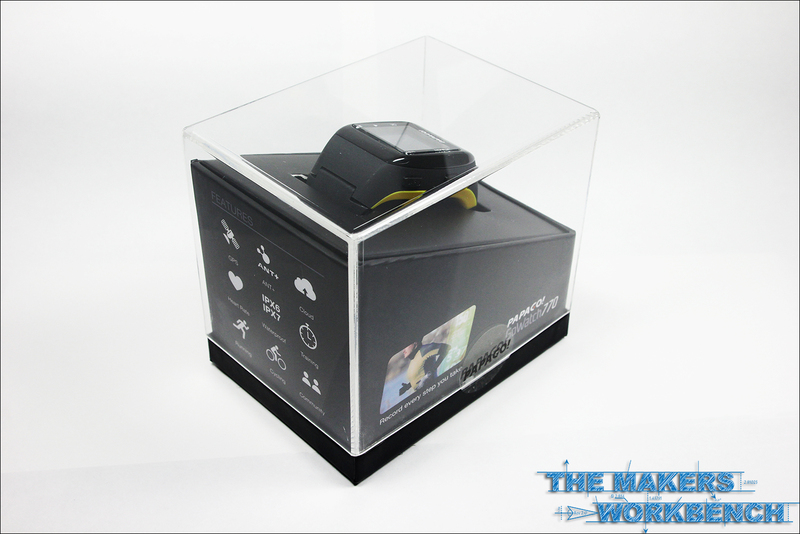 Let’s start things off by examining the packaging that the GOWatch 770 retails in. Some people say that unboxing post are nothing but filler content, but I stand by my previous statements about how the thought that is put into packaging tells a lot about a manufacturers commitment to a quality product. 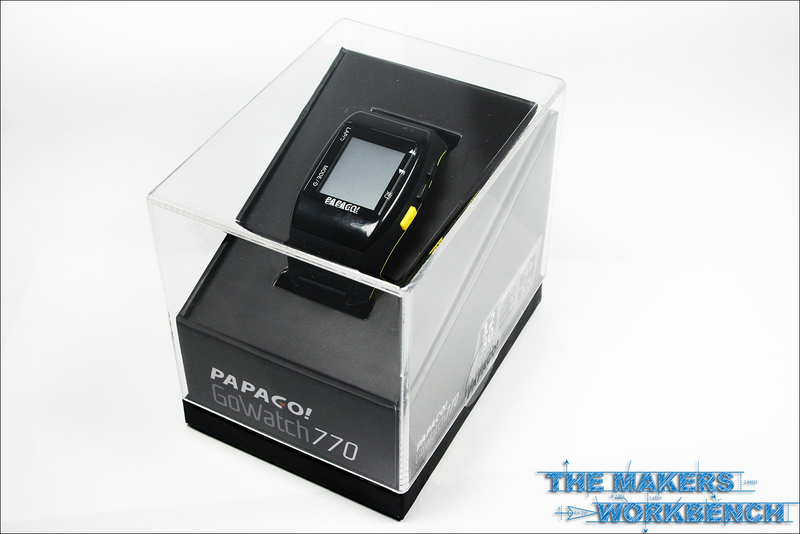 In this regard, PAPAGO appears to have went the extra mile and packaged the GOWatch 770 in a very refined, modern and elegant clear acrylic container with a contrasting black base that not only supports the GOWatch 770, but presents at the perfect viewing angle. PAPAGO did a very good job at keeping its packaging quite simple and left off all of the clutter that we see on most tech packaging today. 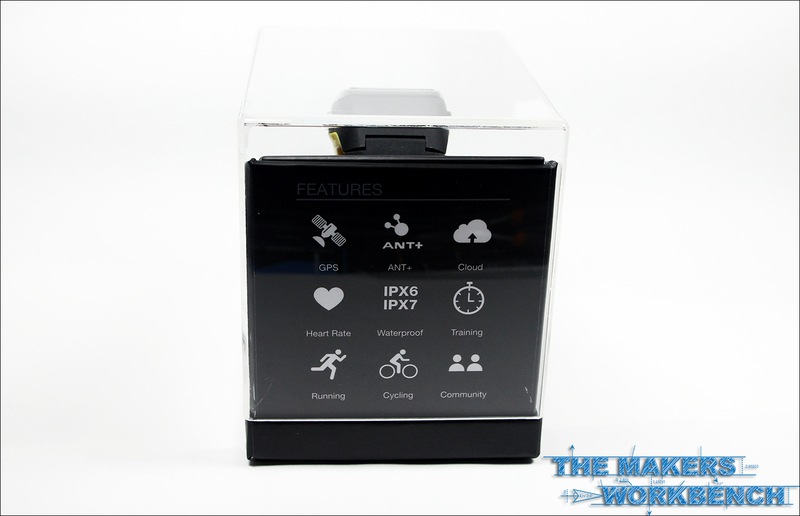 The exception to this is the rear of the packaging where the company has used handy little icons to show off all of the important features of the GOWatch 770. 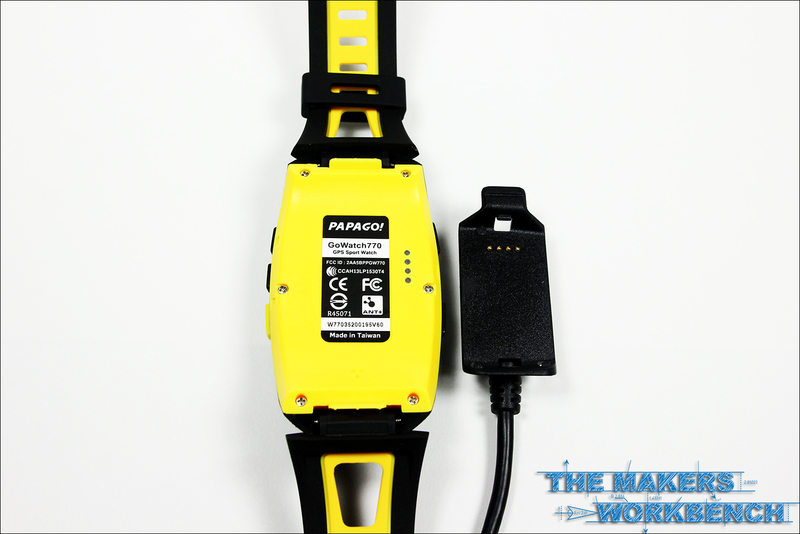 With everything out of the packaging, we can better see how the GoWatch 770 connects and charges via a USB cable with a proprietary cable that uses pogo pins as the connection. I will go more in-depth on this design later though. 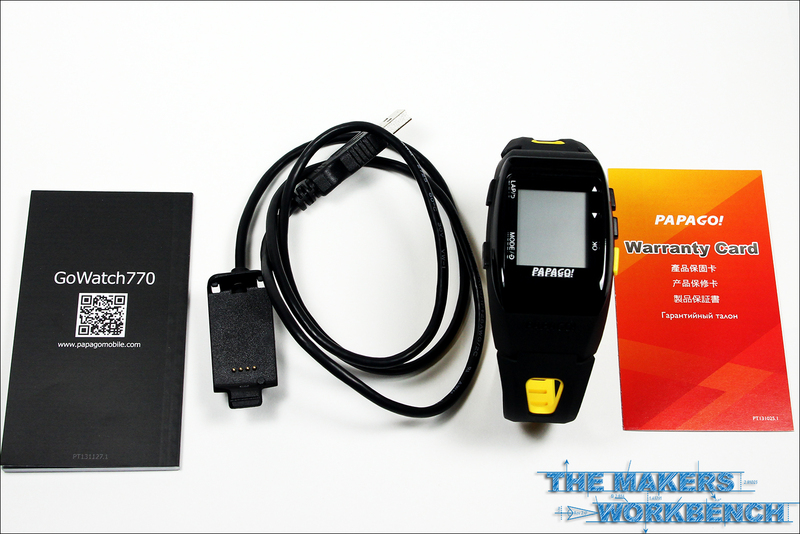 The GoWatch 770 also ships with a multi-language user manual and a warranty card. 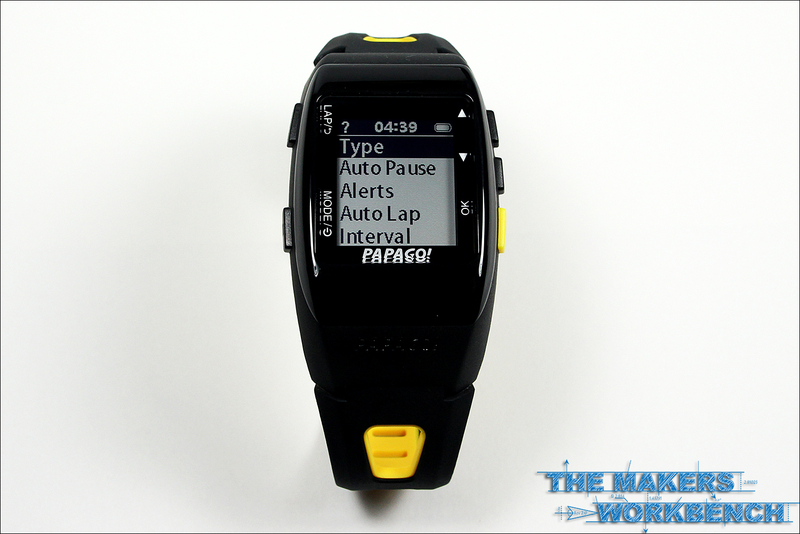 Smart auto back-light allows easy reading for runners. Upon receiving my GoWatch 770, I instantly made plans to head out with my girlfriend to one of our favorite places to take a brisk recreational walk. Unfortunately I had to wait several days for the weather to clear up for us to head out to the park. In the meantime I familiarized myself with the watches functions and features, and figured out how everything works. When I first took the GoWatch 770 out of its packaging, I noticed how robust and well-built the watch felt. The band was soft and comfortable, and the screen was large enough to be clear and visible which makes it easier to see when jogging, running, or any other exercise that requires a lot of concentration. I especially like the fact that the GoWatch 770 features a clip-on charging cable that uses pogo-pins instead of an open micro-USB port for charging, as this keeps sweat, grime, and debris from clogging the port. This also helps with waterproofing, and I did not have to worry about a small seal going out in the future. While the band is made of what appears to be a high-grade rubber, I felt that the clasps was a little less though through as it is a little fidgety to remove if you have large fingers like mine. This is not that big of a deal though to be honest, and since my first few times wearing the GoWatch, I have not experienced any further issues. As I mentioned earlier in this review, I had planned a walking trip which was rained out, I was finally able to schedule a new date that proved to be a picture perfect date for a brisk walk around a beautiful wetlands park. 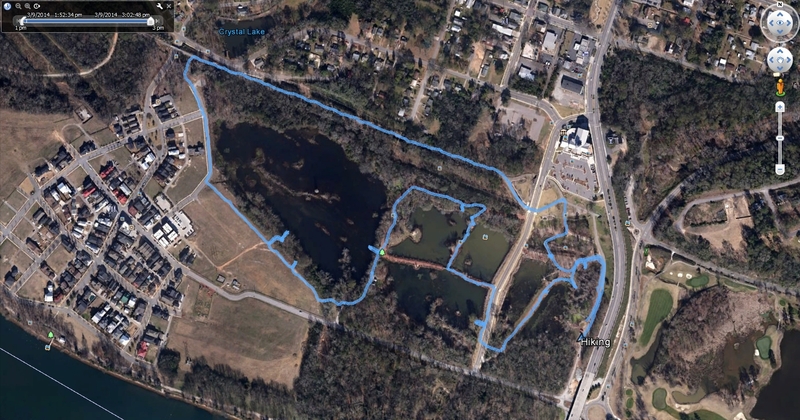 On a Saturday, my girlfriend and I headed out to Brick Pond Park in North Augusta, SC, and spent about an hour walking around the various trails that surround the old clay pit ponds that fill the park. It was a fairly warm day for late winter, with the high being in the 80f range. Usually I do not like anything on my wrist, neck or in my pockets when I am on a hike or walk, but I found that the GoWatch 770 actually is light enough that I did not even notice it being there. 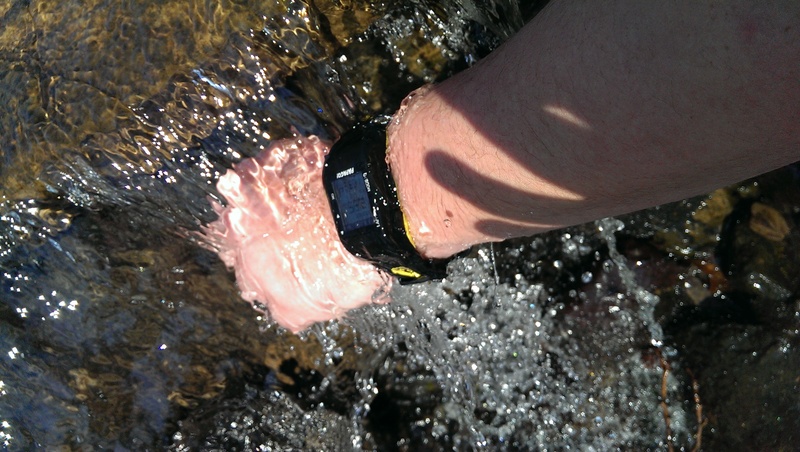 I took advantage of several of the small waterfalls that adorn the park to test the watch’s waterproof claim, and I am happy to report that it withstood several minutes of submersion in both still water, and directly under the waterfall’s pounding water. I also made a point of bumping the watch into a few trees, and then submerging it back in the water to see if it could survive several real world-style shock events and retain its waterproofness. The GoWatch 770 worked flawlessly during my outing that day, and it has managed to survive a 2-week long trip bouncing around in my backpack with books, boxes, development boards, and 3D printed samples bouncing around on it. Not so much as a scratch has appeared on the screen, and the wrist band has taken a beating and survived with flying colors. 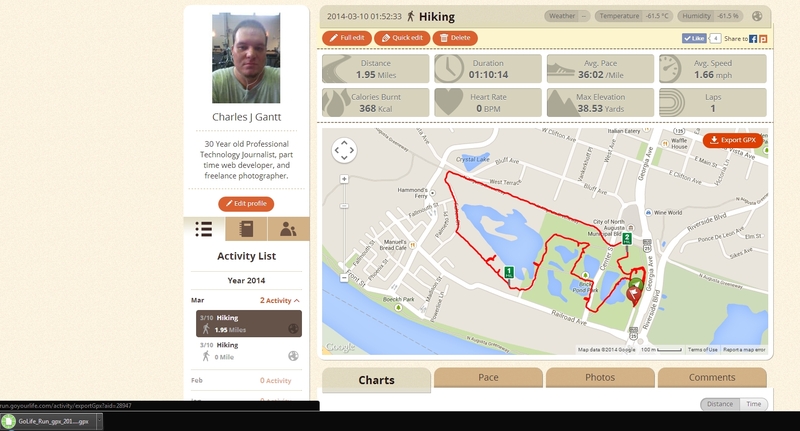 I have since used it several times on walks and hikes, and plan on taking it on a Kayaking trip in just a few weeks. For the kayaking trip, I want to utilize it more as a GPS trip tracker than a fitness tracking watch. One of my favorite aspects of the GoWatch 770 is the fact that it is accompanied by what I consider to be a very intuitive and easy to use web interface that allows me to set and track goals as well as viewing my outing’s statistics in several different metrics. 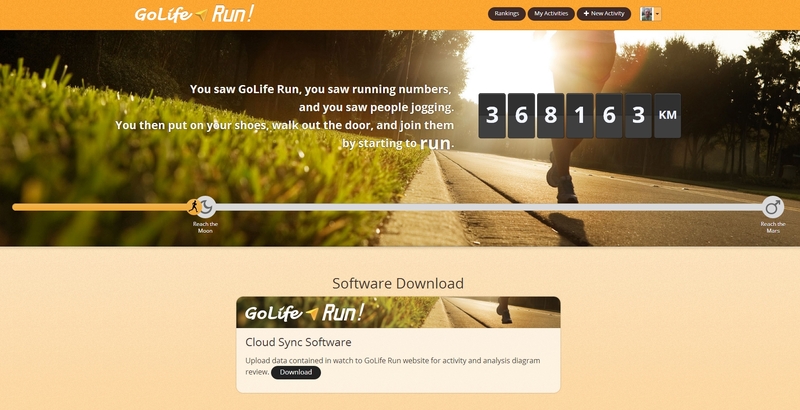 The GoLife Run website is one of the easiest fitness tracking websites I have ever used, and its utilization of Google Maps to show you exactly what your exercise path looked like is something I really appreciate. Before I jump too far into the software, let me first cover how simple it is to import the data from the GoWatch 770 to your account on GoLife Run. 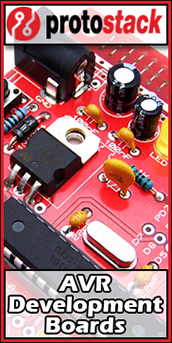 The process is fairly simple and first requires you to download and install the drivers and software required to connect to the watch. You can grab this download by heading over to the GoLife website and downloading the correct version for your operating system. 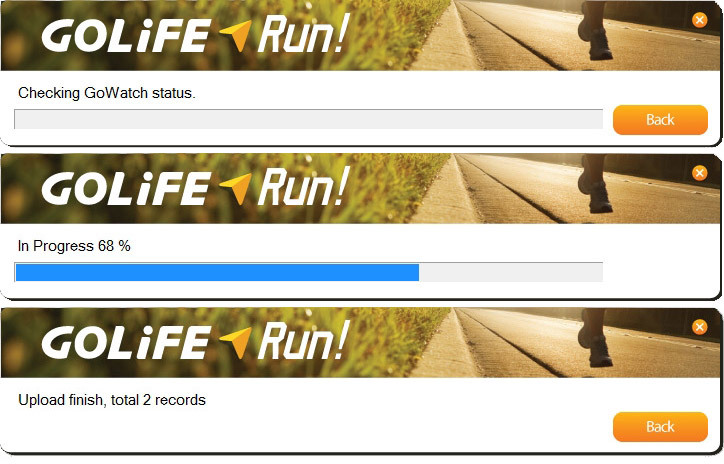 Once everything is installed, you will need to create an account on GoLife Run. When finished you can check the software for updates, or even update the firmware on your GoWatch 770. I recommend doing both. Now that everything has been updated, the software is ready to import the data from your latest trips. This process takes a few minutes, so get it started, and use the next few minutes to catch up on emails, or something. When the data import is finished you will be able to head to your GoLife Run account and view all of the data that was recorded on your recent outings. The GoWatch 770 is able to track many different types of exercises and can extrapolate data such as calories burned based on the type of exercise, user’s weight, and the specific metrics about that exercise. Above you can see the data that was compiled about my trip to Brick Pond Park. I walked 1.95 miles in about 1 hour and 10 minutes. My pace was fairly slow at just over 36-minutes per mile, but that was due to me stopping several times to test the watch under water and to look at scenery. During that trip, I managed to burn 368 calories, and maintain an average speed of 1.6mph. Not only does GoLife Run give you numerical metrics on your workout, but it is also able to graph the data of your trip over its time period thanks to the built-in GPS receiver. 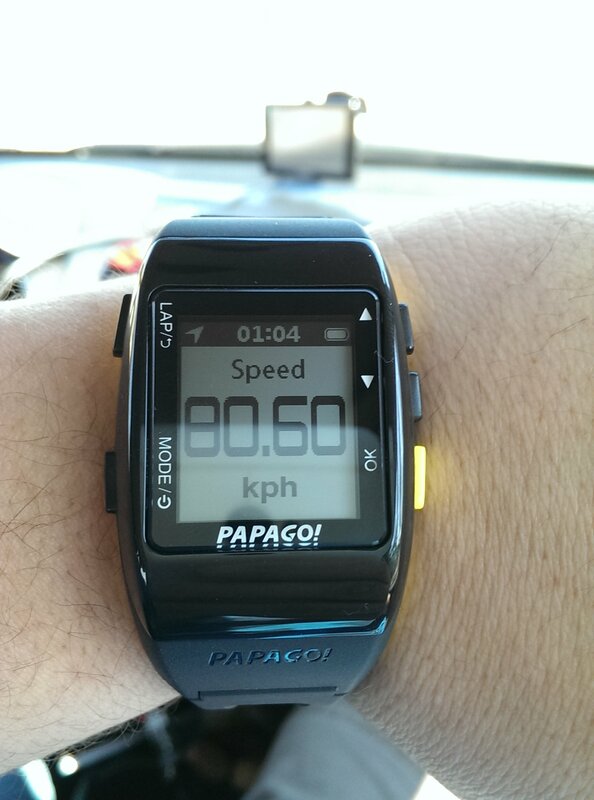 As you can see here, the GoWatch 770 was able to keep up-to-the-minute data on my trip at extremely accurate levels. 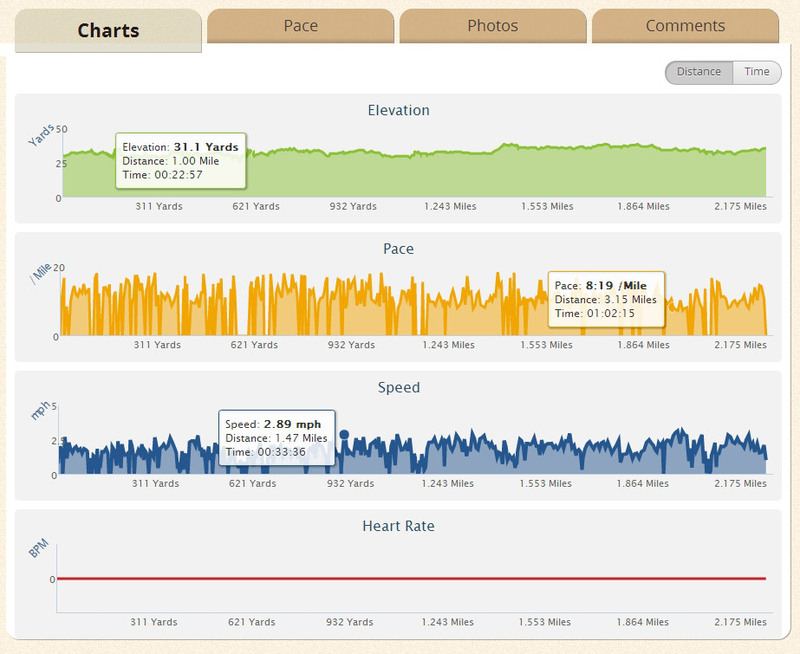 It graphs out Pace, Elevation, and Speed throughout the trip, and can even graph it based on Time instead of Distance. The app also list out these metrics in chart form, and users can even upload images from their trip, that can then be shared with friends. Additionally, the user can leave comments about his trip that could lend insight into the trip and why some things appear as they do. 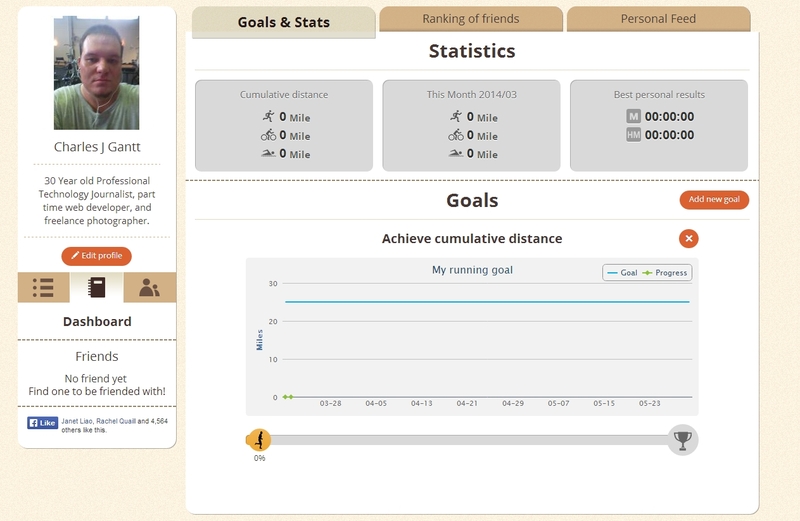 GoLife Run also allows you to set fitness goals for yourself, and compete against friends who have set goals. This is a very big thing for me, as I always work-out better when I am challenged to do something, rather than just doing it. This is my favorite part of the GoLife Run web app though. Since I got my first handheld GPS more than a decade ago, I have been obsessed with tracking my outings on maps, and the GoWatch 770 makes this easier than ever. I was especially surprised at how accurate the GPS module inside the watch actually was. In the map above, you can see every point where I stepped off of a trail, with some of them being less than 4 feet. 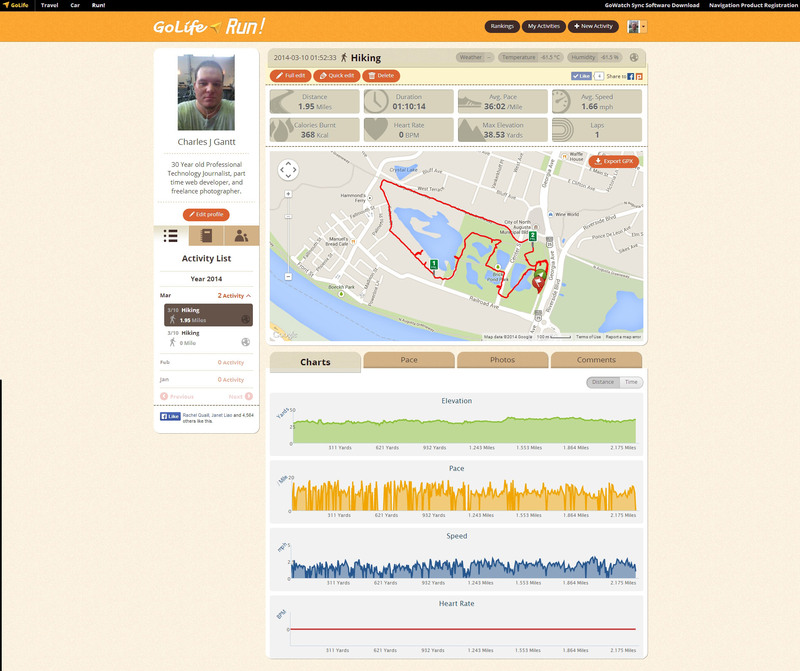 GoLife Run allows users to export their GPS data to use in other programs such as Google Earth. 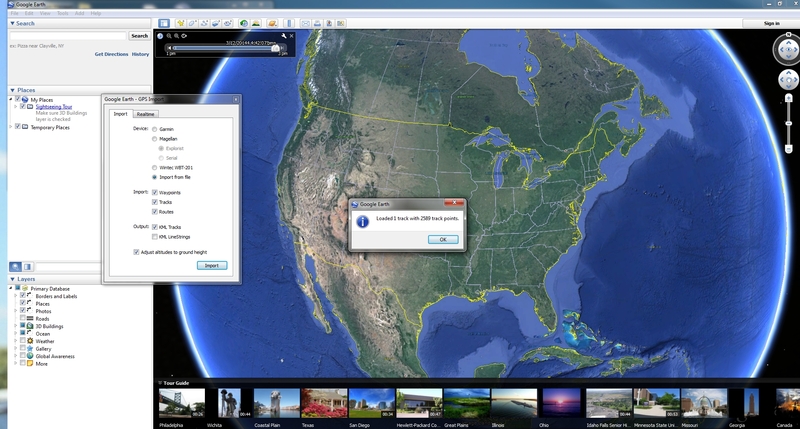 Exporting the data is very easy and just requires that you click the “Export GPX” button located at the top right of the Google Map. 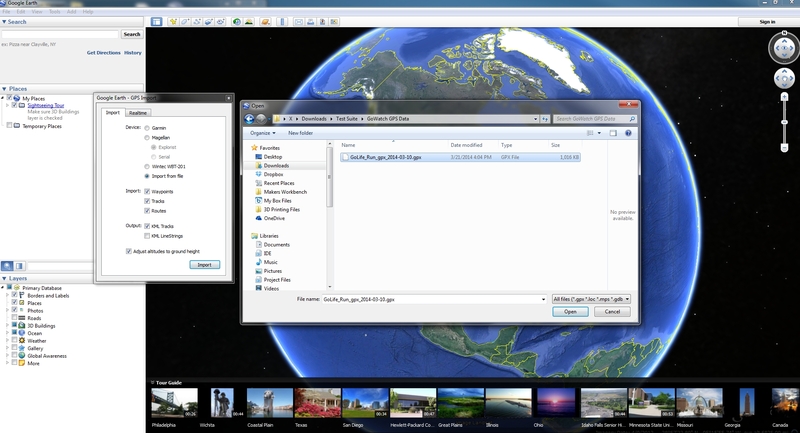 To import it into Google Earth, you need to have the desktop version of Google Earth downloaded and installed on your PC. Head to Eart.Google.com to get the desktop version. 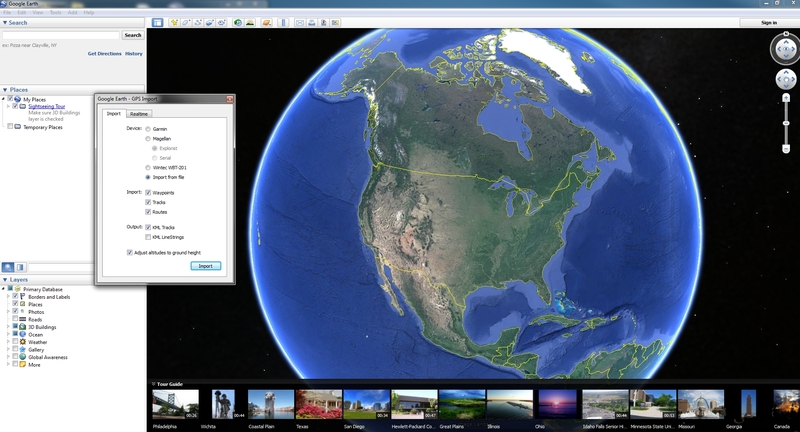 Once installed you will need to click on the Tools Tab and then navigate to the GPS section. 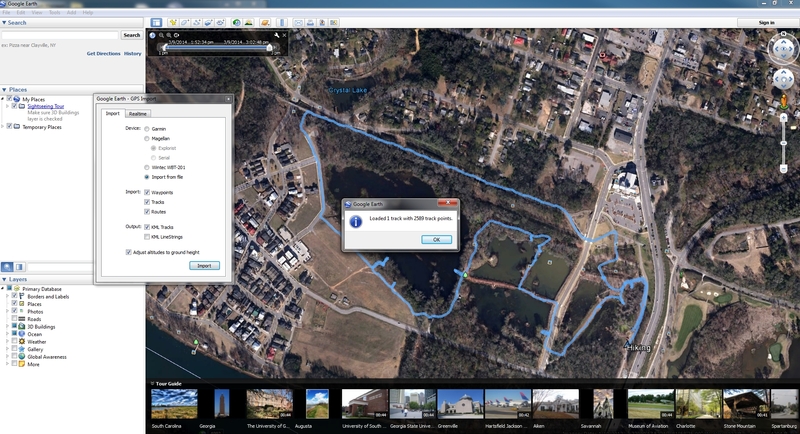 Click on the GPS section and select “Import from file,” this will allow you to navigate to and select the GPX file you exported from GoLife Run. 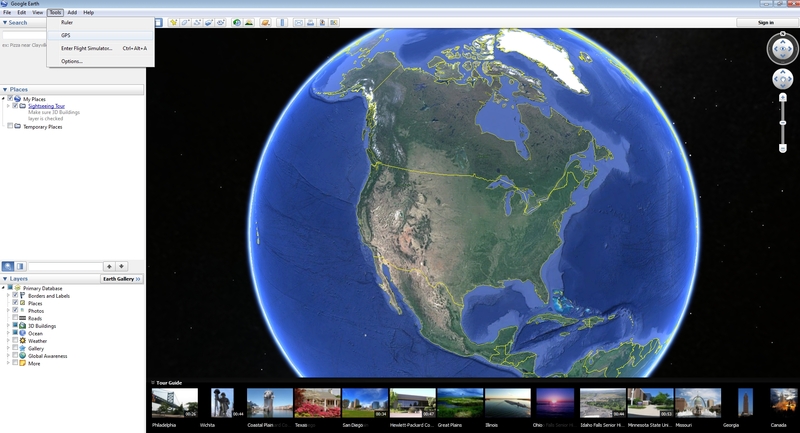 If you did everything correctly, Google Earth will tell you how many data points it imported, and will begin zooming in to the map of your trip. As you can see, the map is almost identical to the normal Google Map featured on GoLife Run. 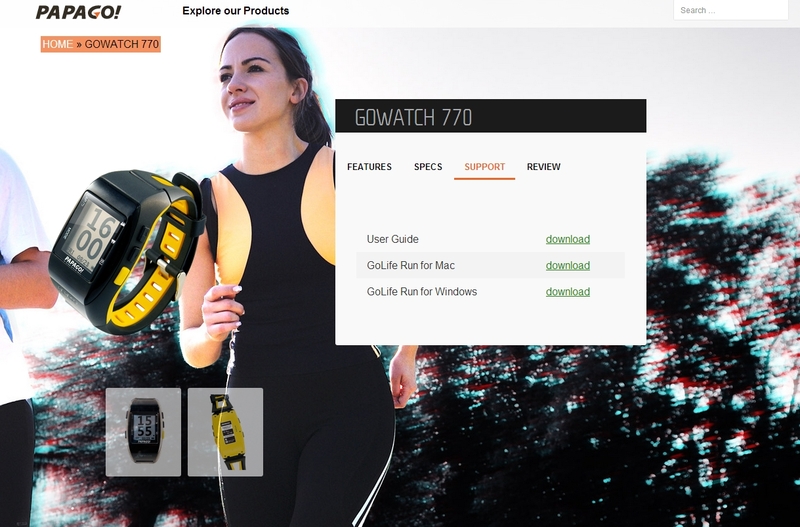 Overall I feel that the GoWatch 770 is a very robust and viable option for those looking to purchase a fitness tracking wearable that is capable of GPS tracking, and multiple exercise recognition. I feel that once I am able to pare the GoWatch with a heart rate monitor, it will become the perfect fitness tracker for me. I absolutely love the fact that it’s waterproof, and robust enough to handle the inevitable bumps and bangs that it will experience with me over the years. I would not hesitate recommending a GoWatch 770 to any of my friends, family or strangers I meet on the street. The watch is exactly what I was looking for in a sports watch, and I cannot wait to get an ANT+ compatible heart rate monitor. If anyone reading this is looking for a very robust, and feature-rich fitness tracking sports watch with GPS capabilities, the GoWatch 770 is for you.